It's fun to say "Mundo"
Last week, while hauling around on the loaner Mundo, we met up with our friends from school who recently bought a Big Dummy. They were interested in the Mundo and we were interested in the Dummy. 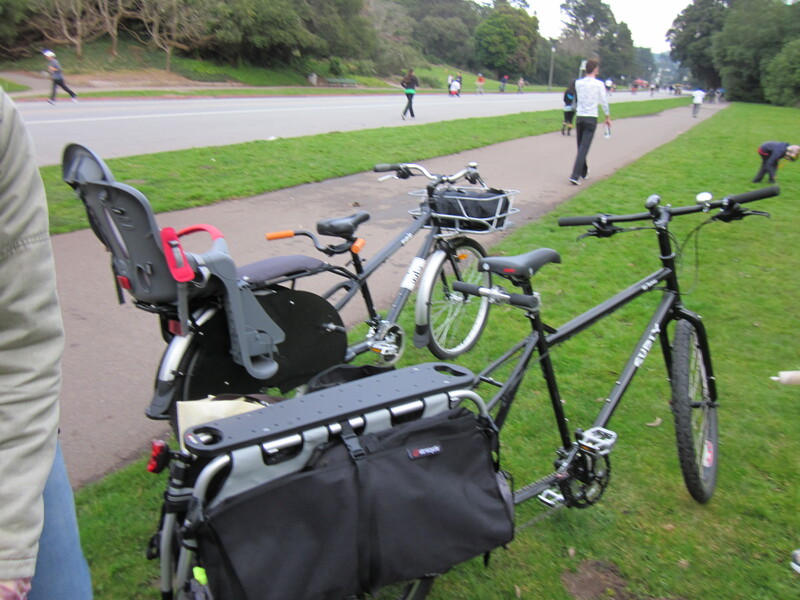 We all met up at Golden Gate Park on Sunday at Sunday Skate to compare the bikes. Shirley takes her girls (1st and 2nd grade) to school every day on the deck of the Big Dummy. On weekends, her husband B.D. rides the bike and she rides on the deck, with the girls riding alongside on their own bikes. She says she gets some great videos this way, and it is an awesome sight to see them riding en masse. The ride to school with the kids on deck is mostly downhill, but she’s got to get them back home again, and they live on Lone Mountain. There is evidently some pushing, but she’s made it up many hills with her legs alone, and reports receiving applause from passing drivers for this accomplishment. 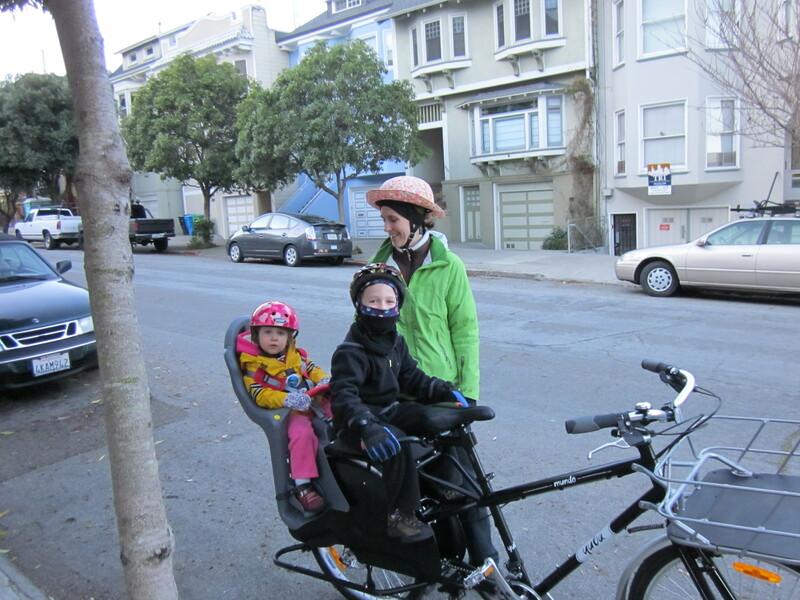 I went up to Alamo Square with my two kids on the Mundo: where is my applause? Honestly, there is no justice in the universe. So anyway, that afternoon they rode around on the Mundo for a while and I rode a bit on the Dummy. We were in the park, so we didn’t try any hills, but it was still an interesting comparison. These bikes look similar in some ways, but they are wildly different. If I had to summarize briefly (not my strongest suit), I would say that the Mundo is like an ox, and the Dummy is like a horse. They’re both useful, but sometimes you want the carrying capacity of an ox and sometimes you want the speed of a horse. Learning to ride the Mundo was not easy for me (not just me). It is a heavy bike that feels more like a wagon sometimes, hard to start and slow to stop, although once the momentum kicks in, riding it is mellow enough. Getting on the Dummy felt like getting on a regular bicycle that just happened to be somewhat longer than usual. I couldn’t ride the Dummy with much of a load, because Shirley and B.D. are taller than I am, and none of us are the kind of people who carry Allen wrenches everywhere we go to adjust the seat height (as if that were not obvious). 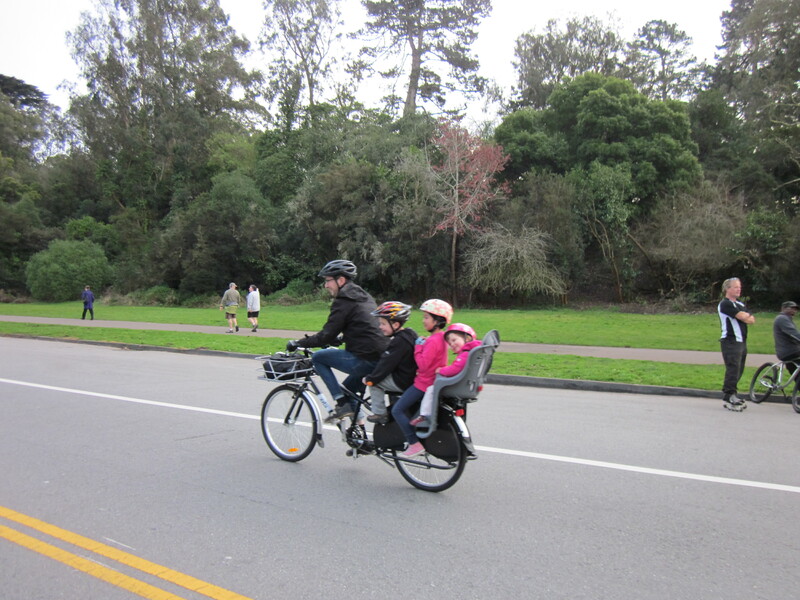 The frame size was fine, but I didn’t feel comfortable putting my daughter on a bike that I had to hop down from at a stop, and for that matter, they didn’t have a child seat. So I rode it mostly unloaded. It felt fast, and it was easy to pick up and ride. But B.D. and Shirley could ride both bikes fully loaded, and their opinions are more informed anyway. 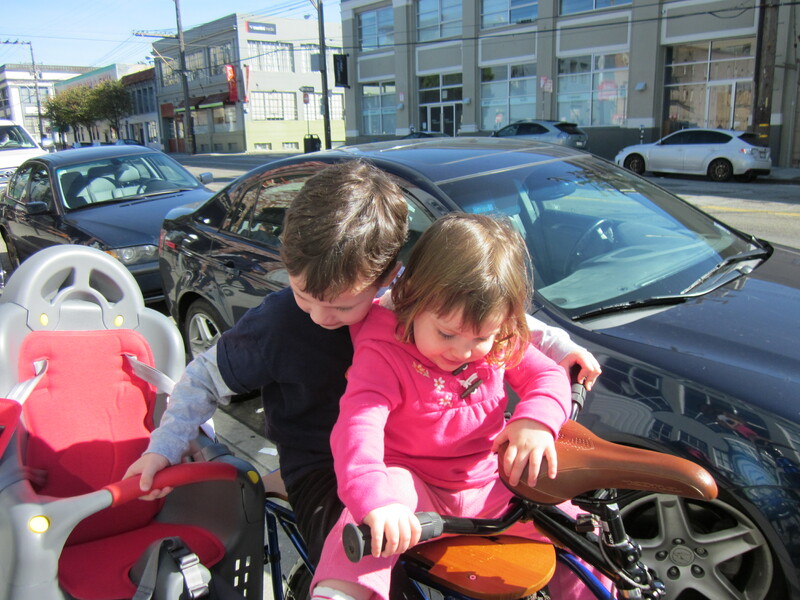 They liked riding the Mundo, particularly the fact that it could carry three kids effortlessly. They feel that two older kids is the maximum safe load on their Dummy. Because they’re used to riding a cargo bike already, they picked up riding the Mundo much more quickly than I did. They too found the Bread Basket disconcerting at first, and almost tipped the bike figuring it out (I am not alone!) But like me, they loved the carrying capacity it added with kids on board. The kids all agreed that the Mundo was awesome, and wanted to pile on as a foursome, which we did not allow them to do. 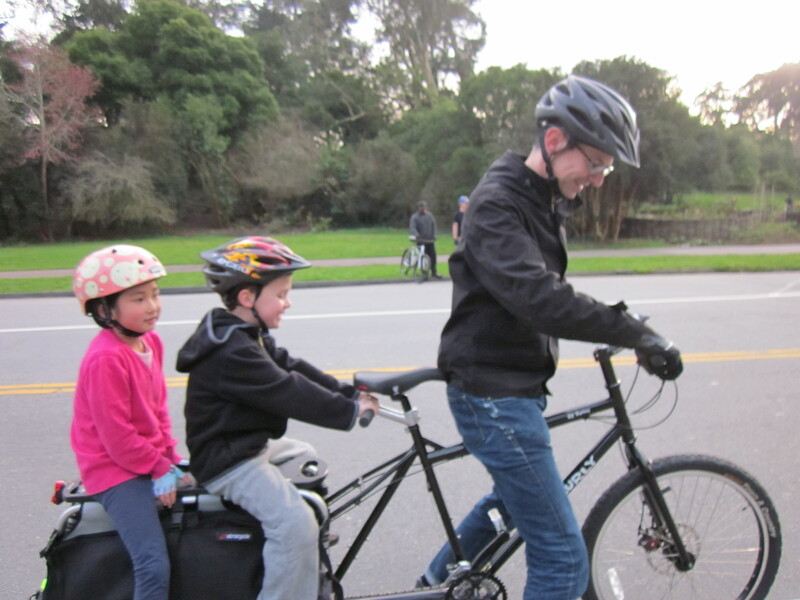 We have limits: only three kids per bicycle! For that matter, they agreed the Dummy was awesome. Both Shirley and B.D. liked the feel of riding the Dummy better, and we all agreed it was more nimble. They also noted that the Dummy had better components, including both a lighter frame and disc brakes (optional and an extra charge on the Mundo). I concur that disc brakes should not be optional on a cargo bike in San Francisco. But, as B.D. pointed out, “The Mundo is $1,000 cheaper!” And it comes with fenders and a double-kickstand that is fearsomely stable, but hard to use: this was the only part on either bicycle that I could operate better than they could, having practiced. Neither bicycle, to everyone’s annoyance, comes with hub dynamo lights. “Why doesn’t our bike have lights?” asked Shirley. “Why doesn’t ours?” I replied. Goodness knows you’re not going to be worrying about weight or drag with either bicycle. Which bicycle would I get if money were no object? Trick question: we’d get the Kona MinUte again. We have realized lately that we’ve underestimated the MinUte; it can do far more than we’d realized. I can ride it! With both kids on board! This is a story for another day. But it’s an honest answer in some ways: I think that both bikes are designed for families that have different needs than we do. We are a small family living in a city with extensive shopping; by preference, we get groceries several times a week in small quantities, and we carry, at most, two children. And we live on a mountain. And we are car-light, not car-free. If we were a suburban/small city family with 3 kids, particularly if they were older and we were more experienced riders: no question, the Mundo. If we were a city family like Shirley and B.D., with more serious shopping loads and a different kind of commute, we’d get the Big Dummy. If we wanted to haul furniture or heavy loads regularly, we’d get the Mundo. If we took long rides, especially off-road, we’d get the Big Dummy—B.D. took their kids on the mountain biking trails around the Palace of the Legion of Honor on the Dummy, and they all had a great time. None of us would attempt that kind of ride on the Mundo. And of course, if money is an issue, the Mundo’s price is dramatically cheaper, even with the shouldn’t-be-optional disc brake upgrade. If money isn’t as much of a concern, the Big Dummy has more range, and it is a lot easier to ride. I couldn’t be more pleased I got the chance to ride both bikes, and our kids were crushed when we had to pack it up at dusk (no hub dynamo lights on these bikes! curse The Man!) Riding around on cargo bikes with our kids is the best way we’ve found yet to entertain ourselves on a weekend afternoon. I would never have imagined this and it is hard to explain. Shirley and B.D. had the same difficulty that I do communicating how wonderful it feels to ride with our kids, completely different from any other mode of transportation or even any other activity. We still can’t believe it’s cheaper and easier than driving, and we keep wondering what the catch is. Like them, I am so grateful that we started this wild ride. I love your last paragraph, and especially this sentence: “Riding around on cargo bikes with our kids is the best way we’ve found yet to entertain ourselves on a weekend afternoon.”. That is so true for our family as well, though things have shifted as the kids have gotten older (my eldest is now 13). Thank you for the informative and inspiring post! Have you thought of using an electric assist motor on either of those heavy haulers or adding a conversion kit to a standard bike, I can’t remember the brand name off hand, but they were about $300. One of our bike club guys built his own cargo bike from used bike frames welded together! Very practical beast, if you can finds someone to brase the two frames together. maybe we should try out diffrent bikes when set to your body lenghts? Thanks for the comparison of those two bikes! I was very curious. I recently rode a Yuba Curry Spice e-bike and was impressed. I’d seen someone on a Mondo sling one around a corner with a load. Got me curious, seems like they know their stuff. I got the impression a Big Dummy would be even better and go more places. I was unaware Kona made a cargo bike – looks like the MinUte is gone but the Ute is still in the lineup. I am not really in the market for one, just curious!